Editor's Note: There is a photo associated with this release. The Canadian Football league unveiled the 2015 CFL All-Stars today. The All-Stars were selected by the Football Reporters of Canada (FRC) and the league's head coaches. This is the 53rd year in which the CFL has named an All-Star team in recognition of the season's best performers. In total, 75 voters selected the 27 All-Stars. 1 - All-Star with five-straight selections (Jovan Olafioye). 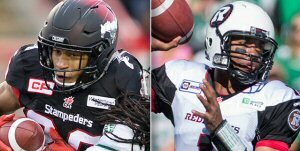 Both Eric Rogers and Henry Burris were named 2015 Canadian Football League All-Stars today. The 27 All-Stars were selected by the Football Reporters of Canada (FRC) and the league's head coaches.